GSH is a small protein molecule composed of 3 amino acids: cysteine, glutamate, and glycine called GSH precursors or building blocks. For cells to grow and divide they go through several very complex stages. Glutathione reduces the oxides, such as hydrogen peroxide, inside the cell that would otherwise prevent cell division and growth. Glutathione protects the DNA from oxidative stress during cell division which allows for DNA synthesis (division). When the DNA is mutated by a free radical stealing an electron from the DNA, glutathione repairs the mutated DNA by giving up an electron to the DNA (replacing the DNA’s missing electron). 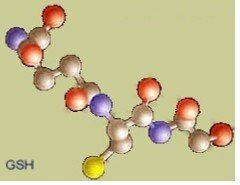 Glutathione maintains our proteins in their proper form. Its sulfur atom reacts with unnatural sulfur-sulfur bonds in proteins, breaking them and allowing the proper pairings to form. Glutathione is predominately located in the cell, whereas a major fraction of the cellular y-glutamyl transpeptidase (glutathione enzyme) is on the external surface of cell membranes. This means intracellular glutathione is translocated out of many cells – glutathione moves substances, such as amino acids, in and out of the cell. Glutathione provides the mechanism by which many enzymes are changed (reduced, transformed or changed from one state to another state). Glutathione is the bridge (catalysis) in the chemical reaction between some enzymes. The highly reactive sulfide bond in glutathione wakes up or activates enzymes so that they carry out their function or are moved from one phase to the next. In the liver, the enzyme glutathione S-transferase takes the sulfur from glutathione and attaches it to toxic molecules, this makes the toxin more water soluble (it is diluted in water easily). Once a toxin is water soluble, it is transported to the body's elimination systems and is excreted from the body. Glutathione enzymes transform carcinogens, through chemical reaction, to unreactive and non-genotoxic compounds that can be eliminated without causing damage to the cell or DNA. Glutathione interacts with foreign chemicals (primarily, it is a scavenger of harmful xenobiotics that have been oxidized) compounds to neutralize and break them down, then eliminate them from the body. In some instances, depending on the state of the xenobiotic, glutathione joins with it instead of metabolizing it. The immune system works best if the lymphoid cells have properly balanced glutathione. The cloning of T-cells consumes large quantities of cysteine. Macrophages (type of white blood cells), which are only present in sufficient quintiles when there is sufficient glutathione, provide the cysteine for the T-cell cloning. Glutathione regulates the binding, internalization, degradation and T-cell proliferation by increasing, as much as two times, the number of binding cellular receptors. More receptors equates to more T-cells being produced simultaneously (multiple T-cell cloning). Cellular GSH also affects the growth and replication of T-cells through growth stimulating cytokines. The role of glutathione in the humoral response is that it protects the cells taking part in the humoral response all along this complex process. A quick synapsis of the humoral immune response: “humoral” means circulating in the bloodstream. This is an immune response (chiefly against bacterial invasion) that is mediated by B cells and involves the transformation of B cells into plasma cells that produce and secrete antibodies to a specific antigen. The process in a nutshell: macrophages engulf and digest the invading pathogen. The digested pieces activate helper T cells which in turn activate the proliferation of B cells that are programed for the specific invading pathogen. Glutathione detoxifies reactive oxygen radicals created by radiation which reduces the damage to the cell. Glutathione also interacts covalently and noncovalently (neutralizes the reactivity in several ways) with parts of the cell that keep the cell from triggering apoptosis (cell death). The action of glutathione in decreasing the damage from radiation is the same as in resistance to UV radiation above. The crucial cysteine molecule is the key to the protection afforded by glutathione. Its sulfur atom scavenges destructive molecules (peroxides and free radicals) converting them to harmless compounds, such as water. Glutathione detoxifies reactive oxygen radicals by giving them an electron which effectively neutralizes them, or glutathione joins with the oxyradical which again neutralizes it. Glutathione biotransforms hydrogen peroxide by turning it into harmless water. Glutathione recycles oxidized lipoic acid, vitamin C and E by restoring them to an active state, mostly by donating the electrons that they used in metabolizing (neutralizing) free radicals. So, instead of having this army of antioxidants flushed out, they are recycled by glutathione and sent back out to work. Glutathione is a tripeptide made up of amino acids CYSTEINE, glycine and glutamate. Glutathione provides and determines the amount and availability of neuronal cysteine. The methionine cycle and the transsulfuration sequence compose the mechanisms for homocysteine metabolism. Transsulfuration sequence requires large quantities of cysteine. It is suspected that the rapid turnover of glutathione in the liver, kidneys, small intestine and pancreas accounts for the metabolism of homocysteine in these organs. Homocysteine metabolism also involves multiple enzymes. Excessive homocysteine is a known contributing factor of hardening of arteries (atherosclerosis). Jean Carper in her book "Stop Aging Now!" claims: "You must get your levels of GSH up if you want to keep your youth and live longer. High levels of GSH predict good health and long life. Low levels predict early disease and death." To be more specific about the articles I have researched to date, raising GSH level has been CLINICALLY PROVEN to be beneficial for people afflicted with: AIDS, Alzheimer’s, asthma, burns, all CANCERS, cataracts, chronic fatigue syndrome, diabetes, autoimmune disorders, diseases of liver, kidneys, lungs, heart, and digestive system, flu, fibromyalgia, glaucoma (open angle only, closed angle not effected), hepatitis, multiple sclerosis, Parkinson’s, physical trauma, skin disorders, seizures, tumors, and more. To state something is beneficial to your health is one thing but to prove it clinically is to give it validity. Do not underappreciate the profound meaning of this statement - raising your GSH level is CLINICALLY PROVEN TO BE BENEFICIAL for a very wide array of health concerns. Antioxidant - GSH is the body’s master Antioxidant, our bodies depend on GSH for the removal of toxins and GSH is at the heart of all immune functions. Other antioxidants in our body depend on GSH to function properly. Detoxification - GSH detoxifies a large number of pollutants by binding to carcinogens, heavy metals, herbicides, pesticides and radiation by forming a soluble compound with the toxin that can then be excreted through the urine or bile. Immune system - Healthy growth and activity of immune cells depends on the availability of GSH. The protective activity of GSH is two-fold – it enhances the activity of immune cells and also functions as an antioxidant within them. Increased Energy - Our energy levels are a result of many factors - everything from the biochemical reactions taking place within our cells, to muscle function and even your sense of well-being. GSH enables the mitochondria of a cell to remain fully charged, enhancing muscle strength and endurance. Clinical trials have shown that lowering GSH in the mitochondria results in cell death. Repair - Our body is constantly under attack from free radicals, some from external sources and some generated in our own body. Free radicals attack the nearest stable molecule, "stealing" its electron. A molecule that loses an electron then becomes a free radical itself and attacks the next nearest stable molecule, this begins a chain reaction. Once the reaction is started it can cascade through hundreds of molecules. As this occurs over and over again the cell eventually dies or mutates. Sometimes the mutated cell mutates to a point that we know as cancer. GSH performs a vital role in repairing the damaged DNA by replacing the missing electron. Normal to elevated GSH keeps the repair of our cells at a maximum and reduces the number of cell mutations that would occur otherwise. What depletes glutathione in our bodies? How to raise GSH levels safely and effectively? What to do to boost your immune system. Oral Glutathione: do pills work for raising intracellular GSH levels? Read the latest GSH research news. Learn about the natural immune system boosters. Raised Glutathione levels fight the oxidation of circulating fats in the bloodstream, including cholesterol, retarding the process of plaque formation in the arteries - the underlying cause for most heart disease and stroke. It is well known that aging is accompanied by a precipitous fall in Glutathione levels. Lower Glutathione levels are implicated in many diseases associated with aging, including cataracts, Alzheimer’s disease, Parkinson’s, atherosclerosis and others. No other antioxidant is as important to overall health as Glutathione. It is the regenerator of immune cells and the most valuable detoxifying agent in the body. Low levels are associated with early aging and even death. Lorna R. Vanderhaeghe & Patrick J.D. Bouic, Ph.D.